You are here: Home / COOKING / Recipes / 5 Traditional Australia Day Desserts – Sugar Free! 5 Traditional Australia Day Desserts – Sugar Free! If you’re looking to cool off then why not whip up a tray of yummy Watermelon Granita to serve in a martini glass or mason jar. Watermelons are juicy and delicious this time of year so we thought it would be the perfect fruit to base this frozen ice recipe on. 1. In a small bowl mix and stir water and Natvia together. 2. In a food processor blitz watermelon, followed by adding the blueberries. Blend until smooth. Add the Natvia water mixture and continue processing until smooth. 3. Transfer to baking dish, cover and freeze for at least 2 hours. 4. Use a fork to break up the frozen mixture. Cover and freeze for another hour. 5. Break up the frozen mix again and transfer in martini glass, paper cups or mason jar. 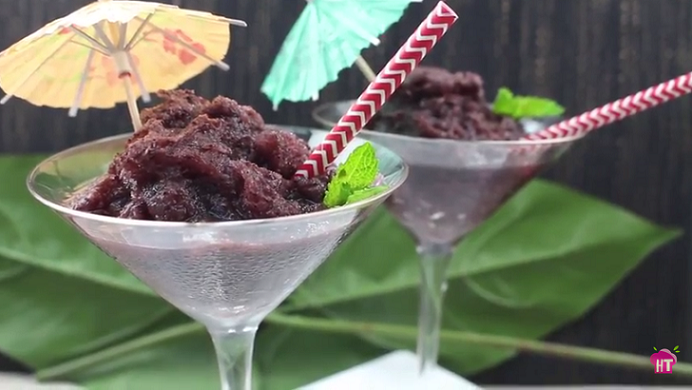 Garnish with more berries, mint, or an umbrella! Enjoy! *Video available for this recipe.